An appeal brought against the ambitious Cascadia Center by a neighboring Madison landowner has yielded very little for the appellant. 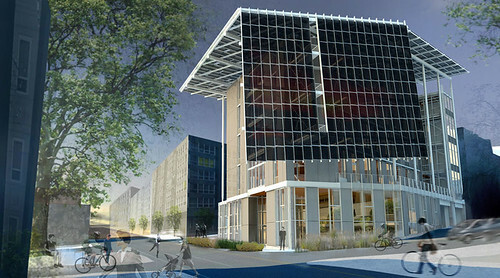 In a decision affirming the Department of Planning and Development’s permitting of the 75-foot, solar panel-covered building planned for the intersection of Madison and 15th, Seattle Hearing Examiner Sue Tanner rejected the arguments of the legal team for Madison Court, a complex of three apartment buildings to the east of the planned Bullitt Foundation development. In a multi-day hearing beginning March 29th, lawyers and representatives for the Bullitt Foundation, developer Point 32 and DPD faced off with the Madison Court team to discuss most every aspect of the much-heralded green project. The Cascadia Center aims to meet the goals of the Living Building Challenge, a set of 20 priorities not least of which are 100% on-site waste management and renewable energy generation. 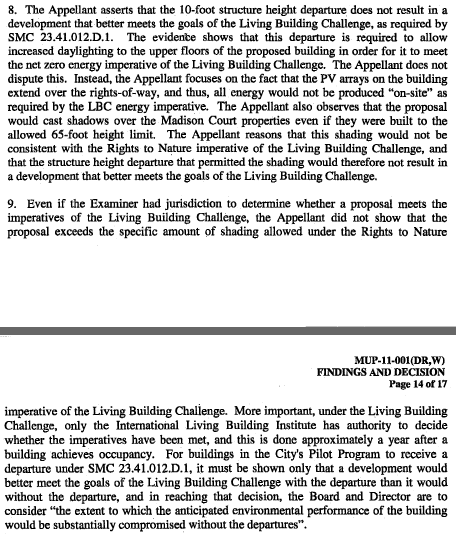 Lawyers for Madison Court had argued that the center should not qualify for the Challenge’s pilot program because its photovoltaic arrays would extend over the sidewalk and therefore the project should not have been granted permission to build 10 feet higher than allowed zoning in the area. CHS broke news of the appeal and posted details of Madison Court’s complaints in February. “Testimony will show that this site was careully selected for this building,” said Melody McCutcheon in her opening remarks representing Bullitt and Point 32. With the Hearing Examiner rejecting most of his side’s arguments — though she did add some requirements around transportation planning and loading and construction hours restrictions — Madison Court’s Morris Groberman tells CHS he and his partners are weighing their options and considering whether to appeal at the Superior court. I think the ugly design is very sad. Some of the high tech stuff is just show and tell. Other features might be of value. 1. It is an ugly box, totally overloaded with collectors. 2. Bullit Foundation money and insider clout will not be easy to beat. 3. I prefer housing to offices for rent – it is a commercial for rent – office space building. I also suspect the solar stuff will be obsolete when installed – that technology is moving very rapidly in Asia and Europe. The building is a great investment in our city and a step forward in energy conservation at the commercial level. Good for the city in making the right decision. The anti development crowd can shove it. Agreed. Lawsuits are a lame attempt at various forms of NIMBYism. I’m so glad this is over and finally this fascinating exploration in sustainable design can go ahead. It takes a lot of money to battle these high powered NIMBYs; a shame that lawsuits, or the threat of, keep other potentially awesome projects like these from even beginning. Ahh, falling back on the tried and trusted “ugly box” statement, I see. That’s so late 2000s. The building IS ugly as hell and it’s in the wrong place. It should be across the street where Taco Time used to stand. The site races across the intersection directly and has no possible way of having even any trees grow up in front of it. It’s perfect for their solar panels. Bullitt picked the spot they did because a little tiny gay bar is an easy target to force out and get the building space they wanted. Unfortunately, this project won’t really know if it complied as a Living Building until it’s been occupied for a year. W’ell just have to wait and see. All that said, the rules can really be too bad when it comes to new building such as this one that have an eye on doing things differently. I don’t necessarily agree with all the rules, but they’re there nonetheless until they get changed or altered. There are also rules against planing in your parking strip, but I’m sure most people would be OK with breaking that one. :) It’s an interesting time in the world of land use, and while I don’t know much about it, it’s nice to learn more through articles like this. Thanks for sharing, Justin. As the CC lawyer pointed out, the site choice was based on many factors in order to maximize solar exposure. No offense but their rigorous studies may be more accurate than your off the cuff recommendation. Also, the CC team worked very closely with CC Attle’s to make sure that their move went smoothly. I doubt they would have been so lucky with other developers, and I guarantee that site would not have sat underutilized for many more years regardless. CC Attle’s has found a fine new home and I’m sure they will continue to be a staple of CH nightlife for a long time. Over 40% of the proposal’s rooftop solar collector array extends over the public right of way, from ten to twenty five feet. Not a ‘zero-energy’ project, where energy is generated on the site. This is an appropriation of public infrastructure for private gain. The height increase and projections over the street increase the visible bulk and scale of the project by over 50%. Not a good model of sustainable development, nor should it be facilitated by the city as a model of green development. In its laudable effort to promote green building, the city has abdicated its responsibility to protect the public domain. I do agree with the folks stating that the project should fit within the development plot and not overhang sidewalks, others property, etc. That would like me adding on a another room to my place that hangs out over the street. Another concern is that are all those panels going to become a huge mirror? If you’ve ever driven passed the Luxor and Circus Circus dome in Vegas at the wrong time, you’ll know what I mean…most of the glass towers here have avoided that problem. Hopefully by the time the structure is built, a way to install the solar cells directly into windows will have been perfected and it will negate the need for the panels. Also, while the city does own sidewalk ROW, the management of it almost always falls to property owner and, as long as pedestrian travel is not hindered, they can usually do what they want. That means plant trees, put out seating, build overhangs. Not sure how this is different. The project will be the first commercial office building and one of the largest projects in the country to meet the Living Building Challenge. Please explain how this project is “not a good model of sustainable development”? See my comments below, but the city specifically has a Living Building Pilot Program to increase flexibility. Similarly, while owned by the city, sidewalk ROW is almost always managed by property owners. It is very common for buildings to build overhangs onto public ROW. In fact, downtown it is practically required. Why not a good model? Typical projections allowed over right of way are four to six foot pedestrian weather protection (marquees) at 12′ height, under a temporary street use permit,with public benefit. Not typical are ten to twenty five foot projections at 80′ foot elevation (in a sixty five foot height limit) for private electrical generation, which amplify the apparent scale of the building and block out the sky. Imagine the latter on both sides of a sixty six foot right of way. Public streets like Madison or Broadway would start to feel like indoor malls. “There is a disturbing trend towards privatizing infrastructure…A subset of this trend is the notion that individuals can own access to nature..” I see a view of the sky above the street as ‘access to nature’. This proposal should be reduced in size, or built on a larger site which doesn’t require using the right of way to generate power. I agree. It’s ugly and will be an eyesore at that location. The overhangs are not over a sidewalk, they are over an alley designated as a fire lane. This is not a place where people are walking, its a place where vehicles are moving. Check the DRB and MUP submittals. 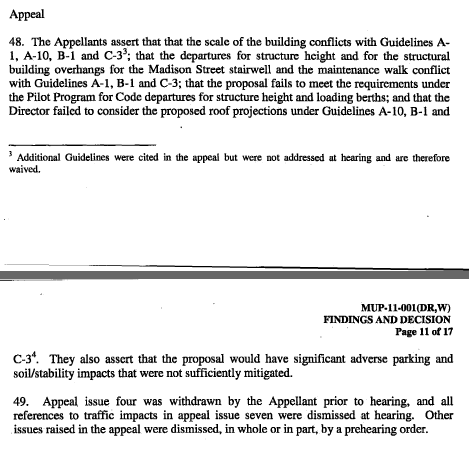 Proposed overhangs over public property are more than ten feet over E. Madison St., over twenty feet over Fifteenth Avenue East, fifteen feet over East Pike St., seven feet over the alley, all overhangs continuous. All of these streets have pedestrian traffic. So the overhangs will protect people from the rain. I still don’t see how you can have such a beef with such a well-intentioned project just because it overhangs the street and sidewalk far, far above your head. Do you walk around staring straight up at the sky all day long or something?